The groundswell is swelling, but is the promise of change as promising? For millennia, we have relied on traditional institutions to make decisions about resource allocation. Institutions such as governments, schools, congregations, companies, lower the cost of organizing individuals into groups. As a result, traditional institutions often have a monopoly on large-scale coordination and the allocation of public good. When institutions fail to decide on resource allocation productively and fairly, we replace them with other institutions, sometimes peacefully, sometimes violently. 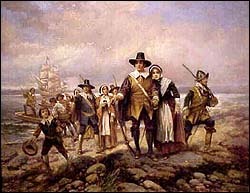 The Pilgrims packed their bags because religious freedom was unevenly distributed in the Old England; they built a new institution in New England based on the Mayflower Compact. Louis the XVI was dragged to the guillotine because his wife didn’t know that the common people had no cake to eat; the angry mob wanted a new institution for the common people. But lately, we have gone outside of traditional institutions to get what we want, a phenomenon called groundswell. A new kind of hierarchy – one represented by people with diffused power – has emerged, removing the dominance of traditional institutions, says Clay Shirky in his book, Here Comes EveryBody. Groups formed in the past were not all that we had wanted; instead, they were all that we could afford. As new communications technology has caused a collapse in the transaction costs of managing groups, new kinds of group-forming and self-organizing are taking place like never before. The Internet has changed the way we communicate: to speak is to publish is to participate. Newly capable groups are built upon a new architecture of participation that harnesses self-coordination and collective intelligence from a participating crowd. Therefore, Shirky suggests that power is transferred from people privileged with unique capabilities and authority to the masses. Li and Bernoff, the authors of Groundswell, argue that new technology enables people to get what they need from each other, rather than from traditional institutions. The groundswell is swelling, but is the promise of change as promising? Even Shirky admits that traditional institutions are not withering away; their advantages have only been eroded in relative terms. As Li and Bernoff caveat, technology is merely an enabler. The groundswell must come from the collision of three forces: people, technology, and incentives. Wonders can happen, so long as the technology is in the hands of the right people (those who are “almost-always-connected”) with the right incentives. The fact that group-forming has become easier does not necessarily mean these groups can make certain decisions about resource allocation like traditional institutions do. Had the technology available today been available in the past, the Pilgrims could have started a “Mayflower Petition” online to raise awareness about religious intolerance in England. Their trip could be funded through a Kickstarter campaign, and Twitter would explode with #Mayflower. Nevertheless, the decision to persecute the Pilgrims still rested in the hands of King Charles I. Unless the power structure of England were completely overhauled, any kind of groundswell change would be filtered through existing institutions, namely the church and state. England was not even a democracy at that time, and freedom was a limited concept reserved for a fortunate few. Fundamental change requires much more than signing petitions or joining a Facebook fan page; converting people from slacktivists to activists is the real challenge groundswell does not address. Based on Shirky’s “three rungs of activities” framework, transaction cost involving information sharing has likely collapsed the most thanks to the Internet. Cooperation, which relies on shared creation and behavior synchronization, has also become more manageable. Collective action, however, requires the group to negotiate within itself to reach a collective decision, a shared responsibility for action that is binding on all other members of the group. Going from zero awareness to information sharing is easy. Taking the leap from shared awareness to collective action is much harder. How much ground will traditional institutions give to the groundswell movement? Does groundswell actually make traditional institutions more important? Clay Shirky described in his book a story where the NYPD responded to online public pressure to arrest an individual alleged of theft. The interesting point about this citizen campaign is that the desired outcome still relied upon the NYPD, a traditional institution, to take action. Twitter enabled the masses to gather in Tahrir Square and started a revolution. But soon after the old regime was toppled, another traditional institution took over, followed by yet another. It is probably true that when technology changes the way we communicate, we also change society. But the jury is still out on the extent and sustainability of such change. 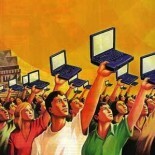 The next big challenge is to evolve digital activism from self-organizing and mobilization in the short run to fundamental change in the long run, to turn ad-hoc public pressure valves into permanent institutions – not the traditional kind – but ones that truly consists of people with diffused power. This entry was posted on December 2, 2013 by elsasze and tagged Clay Shirky, Groundswell, Mayflower Compact, Pilgrims, Twitter.